FREYGEIST combines the technology of a modern e-bike with the design of a conventional racing bike. FREYGEIST has reinvented the e-bike. The company's modern e-bike technology that looks like a conventional bike provides bikers with excellent handling. In other words, this reimagined e-bike weighs only 12 kg, but its light weight does not have any negative impact on its battery capacity, power, or transmission system! Our target group consists of "urban professionals," a group of over 1 million potential customers worldwide. Thus, FREYGEIST focuses on a rapidly growing market. Commuters and bike enthusiasts are frantically searching for alternatives to cars and public transportation. Daily traffic jams, a lack of parking spaces, traffic prohibitions, and constant delays in public transportation are nerve-racking and frustrating. As nobody wants to arrive at the office soaked with sweat, conventional bikes are often no real alternative. The affluent group of "urban professionals" aged between 25 and 45 is particularly interested in independent mobility, but its demand is currently not met. The FREYGEIST e-bike targets precisely this market. E-bikes are an excellent solution for urban mobility, for they are fast, flexible, and convenient to handle. Established e-bike manufacturers, however, have ignored this trend and are offering affluent and design-oriented e-bike purchasers mostly unattractive and hefty bikes instead of state-of-the-art solutions suitable for urban areas. A FREYGEIST bike, on the other hand, weighs as little as 12 kg, i.e., half as much as many other e-bikes. It has all the advantages of a conventional bike, for it is light and maneuverable and is not subject to any legal restraints, yet it has the power of a modern e-bike. Thus, it may easily be transported through hallways, on stairs, or in urban areas. We have developed the FREYGEIST design ourselves by combining minimalistic retro design with high tech in a unique fashion. In total, developing the bike took us approximately one year. Even before the official market launch, we have received 30 verbal preorders for the first FREYGEIST series from friends and acquaintances. We possess a sales list consisting of roughly 30 retailers, the ten most promising of which we want to attract as our official dealers in the DACH region (Germany, Austria, Switzerland) over the next few months. Moreover, we have exclusive access to more than 100 potential salespeople in almost all major European cities that have already proven their sales competence in our target segment of premium urban lifestyle. Smart Capital. We have attracted Martin Egger – an experienced investor and marketing and sales expert – as a partner of FREYGEIST. Martin Egger is a serial entrepreneur, angel investor, and shareholder in over 10 companies. Moreover, he is co-owner of the "lautstark communications" media agency (www.lautstark.com). lautstark consists of more than 100 permanent employees and freelancers and works for customers such as Daimler, Mercedes-Benz, BMW, Orange, etc. ; lautstark also promotes events and has already gained experience in e-bike marketing. Martin Egger and lautstark will constantly support FREYGEIST with their expertise. The e-bike market has been developing very positively over the past few years. According to a study by ZVI, the number of e-bikes sold increased threefold from 150,000 in 2009 to 450,000 in 2014 in spite of all economic crises, and this number is still on the rise. The Concept. FREYGEIST e-bikes meet the legal definition of a PEDELEC 25 and thus combine two worlds: that of the conventional bike and that of the e-bike. Indeed, our bikes combine the full flexibility of a bike (e.g., the permission to use bike lanes in the opposite direction in one-way streets and no insurance requirements) with the comfort of an electric motor. While going to work in the morning, riders are supported by the motor. In the evening, when taking a shower afterwards is no problem, they have the option of going home without motor support. Where Do We Stand? Last year, we made our prototype ready for series production. We will be able to order bikes from our assembler as soon as approx. EUR 200k for the first batch are available to us. We have recently ordered a test batch of 10 (very expensive) demo bikes, which were delivered to Vienna free of faults and within roughly three weeks. We are currently expecting the first shipments to take place in mid-July. Technology. The motor is located within the rear wheel hub. It supports the rider up to the legal maximum speed of 25 km/h (which is a deliberate limitation). In some countries (e.g., in the U.S.), higher speeds are also permissible. By means of a switch at the handlebars, riders can turn the motor on and off. Also, riders can choose between five levels of motor support. Level 5 corresponds to the power of a professional cyclist, whereas level 1 corresponds to light tailwind. The battery is integrated into the frame and is thus invisible from the outside. Power-to-Weight Ratio. An excellent power-to-weight ratio has proven that FREYGEIST is currently the technological leader in its segment. We are not aware of a single mass-produced e-bike (PEDELEC) that has more power per kg of weight. Because of its above-average acceleration, its light handling at maximum motor support, and its low weight of only 12 kg, the FREYGEIST e-bike is a superb product. Thus, FREYGEIST is the ideal choice for customers looking for the comfort of a powerful electric motor combined with design and suitability for everyday use. Competition. Currently, the market segment of lightweight e-bikes is marked primarily by one aspect: sacrifice. If customers want less weight, they have to accept smaller batteries, less motor performance, or a fixed gear ratio. The result is a loss of comfort. Consequently, such bikes are very suitable for sports, but not for everyday use. FREYGEIST, on the other hands, combines the best of both worlds. Unique Selling Proposition. In addition, FREYGEIST combines the advantages of two worlds of products: the aesthetic fascination of classic luxury and design bicycles and of high-tech e-bikes. None of our competitors offer this combination of urban e-bike and lightweight city bike suitable for everyday use. Potential. A true technology company, we have the long-term strategic goal of developing and marketing the leading software and electronics platform for lightweight urban transportation based on the FREYGEIST technology. By means of this platform, we will be able to further improve our position within the e-bike market and to access neighboring markets, for instance the market for lightweight electric four-wheel vehicles ("a car for the price of a bicycle"). We believe that this segment is particularly promising in emerging markets, where we may sell several ten thousand such vehicles each year. We will put our strategy into practice together with the Vienna University of Technology and other internationally renowned research partners. The capital will be used for increasing our expertise in lightweight design, improving the motor, and – most importantly – developing software. The Future – an e-bike without a power plug. Also, our technology road map includes offering the first marketable, full-fledged, and completely self-charging e-bike (Recu) by 2018. Furthermore, we possess almost a half dozen of other technological innovations at the concept stage that we may not make public before they have been patented. You can look forward to exciting innovations on a regular basis over the next few years. Electric mobility is a global growth market whose growth rate is estimated at approx. 10 to 15 % per year, depending on the study considered. Approximately 1.5 million e-bikes sold in Europe in 2014 are a clear signal. An important proportion (almost 600,000 bikes) of this sales volume is due to the DACH region, as – for instance – an article published on heise online confirms. Compared to conventional bicycles, whose market is saturated and marked by low margins, e-bikes provide manufacturers with a significantly higher sales and return potential. Most recently, the average sales price of e-bikes in Germany was approx. 2,500 euros. Approx. 50 % of Germans can imagine buying an e-bike. a love for detail, an interest in environmental protection and independence. Members of the FREYGEIST target group prefer brands such as BMW, Vespa, TESLA, Apple, and Converse and are willing to pay prices for these brands that are (well) above average. They are irrational in a rational way. In other words, they are typical FREYGEIST customers – around the globe. We have analyzed the size of this target group in our target cities. Within the DACH region, these cities are: Vienna, Zurich, Munich, Stuttgart, Frankfurt/Wiesbaden, Cologne, Düsseldorf, Hanover, Hamburg, and Berlin. For the remaining part of Europe, we have defined another twenty target cities. On average, we expect to achieve a number of 6,300 purchasers in cities with a population of more than 800,000 people. There are several hundred cities of this size worldwide. Having considered various local factors, opportunities, and risks, we estimate our global target group at approximately 1 million people. FREYGEIST will generate earnings by selling e-bikes and accessories, for instance anti-theft devices (locks & GPS), safety accessories (LED lighting systems), and comfort accessories (fenders). Basic assembly of our e-bikes will be performed by an external assembler specializing in bicycles and e-bikes. This partner supplies the majority of large bicycle manufacturing companies around the globe with goods and has been doing business with practically all relevant component suppliers (e.g., Shimano) for many years. We can adapt the order volume to demand as long as we order a minimum batch of 150 bikes. As we do not manufacture the e-bikes ourselves, we do not need to invest in our own production unit. We can use an established quality management system. We can use standardized warranty agreements. We can get much better terms for purchasing. We perform quality checks of every single e-bike (!) on site and individually approve bikes that have passed all checks. Only such bikes are then shipped to our intermediate storage facility in Austria, which we can use free of charge. From there, UPS ensures direct delivery to evangelists (direct sellers), official dealers, and direct customers. During the last few months, we learned that the decisive factor in the purchase is a test ride. Only through this test ride may potential customers experience the unique FREYGEIST feeling and may be truly and immediately convinced. Therefore, we are using a sales system that enables a maximum number of test rides in a cost-efficient manner. Because of numerous discussions with potential customers, retailers, and bicycle manufacturers, we decided to adopt a mixed approach consisting of (1) direct sales, (2) licensed dealers, and (3) e-commerce. The use of "evangelists" is at the heart of our strategy. Evangelists are trendsetters who have a solid network within the target group and who receive a sales commission for every FREYGEIST e-bike they sell. For example, such evangelists work as upscale real estate agents or personal trainers. Our evangelists must have a high affinity for the FREYGEIST bike and for the brand message. We have a shortlist of roughly 100 evangelists in our target cities in Europe, who (i) have already proven their sales expertise within our target group, who (ii) have already established a customer base within the target group, who (iii) acquire new customers on a regular basis, who (iv) may supplement their product range with FREYGEIST, and who (v) are freelancers and are thus used to working based on a sales commission. We choose our specialist retailers based on precisely defined criteria (e.g., inner-city locations, aesthetic showrooms, competent service). Unlike in the case of most other bicycle and e-bike manufacturers, retailers do not have to purchase our FREYGEIST bikes. Instead, they receive test bikes free of charge. Consequently, our retailers reduce their capital commitment, and FREYGEIST will become available in stores much faster. Retailers receive an individual sales commission based on, for example, the quantities sold, the quality of service, and local factors. Also, we ensure that retailers receive an attractive margin. All of our retailers are exclusively in charge of their sales area. 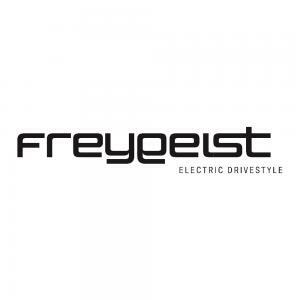 While they also sell FREYGEIST e-bikes themselves (that is, broker sales between FREYGEIST and customers), their primary areas of focus are service, maintenance, and the sale of accessories to all FREYGEIST customers via our web shop. Thus, FREYGEIST specialist retailers generate revenues through maintenance work on new customers' bikes (which are directed to the shops by brand ambassadors) and do not have to make any advance payments. The FREYGEIST Online Store is a modern web shop and has its own section for retailers and brand ambassadors. This sales channel is by far the most profitable one for FREYGEIST. At the beginning of Q3 2015, we will launch our first online campaign in collaboration with lautstark (the PR, marketing, and event agency of our angel investor), and we will inform you of the results toward the end of the year. FREYGEIST is a premium brand whose sales price is the same on all distribution channels. We do not offer any discounts. The sales price for consumers is EUR 3,999 (incl. VAT). We determined this price based on demand within the market, our position within the premium segment, and the pricing strategies of our competitors. Thus far, more than 30 people have verbally signaled their intention to purchase our e-bike. We will begin marketing our bikes in seven cities in the DACH region (Vienna, Zurich, Munich, Frankfurt, Düsseldorf, Hamburg, and Berlin). For the development of our sales structure, we can rely on the considerable expertise of lautstark.com. lautstark has already organized numerous events for the smart ebike in these cities. Because of our collaboration with a supplier that is established within the market and able to produce several ten thousand bicycles per year, a production shortage is unlikely. Furthermore, we can easily switch to alternative assemblers while keeping the risk relatively low. If we experience sufficient demand, our growth will be limited by the recruiting of suitable retailers and evangelists and by the availability of working capital (the difference between current assets and current liabilities of the company). We will manage working capital in a particularly careful manner. After our crowdfunding campaign, we will soon introduce a suitable ERP system – a software to represent and manage the operational value-adding process and to manage liquidity. Ussi is an engineer through and through, and he puts Martin's ideas down on paper. Ever since the first technical drawing, he has been working on making our vision of a new urban mobility – the FREYGEIST e-bike – ready for series production. In addition to technological improvement of the product, Ussi also supervises the departments of IT, global logistics, and production management at FREYGEIST. Stephan is the level-headed part of our team and keeps track of the finances at all times. Moreover, he supervises all aspects of marketing, sales, and human resources during the company's initial development. Martin Egger is a serial entrepreneur, angel investor, and shareholder in over 10 companies. He is co-owner of the "lautstark communications" media agency, which has more than 100 permanent employees and freelancers and works for customers such as Daimler, Mercedes-Benz, BMW, and Orange. We are able to use lautstark and its network of participations for our purposes. Florian Potucek (of ERGO Insurance Group) is another one of our partners. Florian has considerable experience in the development of large sales forces of up to 100 people. He will actively support the FREYGEIST team in the development of its pan-European sales organization. TELE HAASE STEUERGERÄTE GES.M.B.H. (www.tele-online.com). Tele Haase is a leading company in electronic control systems and thus an ideal partner for FREYGEIST. Because of this partnership, the implementation of future technologies such as smartphone control, safety systems, inductive charging, or energy recovery 2.0 will be possible. Our advisor Johann Ehrentraut is responsible for technological trends, strategy development, and the design of innovations. He has several years of experience in automation and IT and provides FREYGEIST not only with considerable expertise in control technology, but also with the company infrastructure. svs Capital Partners GmbH (www.svs-capitalpartners.com). We benefit from several years of experience in C-level management, venture capital, private equity, corporate finance, and business development as well as management capabilities, a solid knowledge of processes, and experience in crowdfunding. cSt-causa Steuerberatungs GmbH (www.cst-causa.at). From the very beginning, our partner cSt-causa has supported us in founding our new company. Because of this partnership, FREYGEIST benefits from the company's international network, long experience, and specific knowledge of equity-based crowdfunding. cSt-causa is essential to the tax structure, stable growth, and successful company development of FREYGEIST in the future. In the past twelve months, we reached several important milestones. The three of us worked full time on the project. Our prototype is complete and has been tested. People on the street turn their heads when they see it. An experienced investor supports us. Thus, now is the right time to launch a crowdfunding campaign. This crowdfunding campaign will provide us with the opportunity to sell the first e-bikes in the strongest months of the year. Depending on the success of our crowdfunding campaign, we plan to deliver the first bikes in June or July. We need the capital raised through crowdfunding to finance the first few batches, to provide retailers and evangelists with demo bikes, to make provisions for warranty costs, to purchase accessories, and to cover the costs of our market entry and of business development (office, IT, and first employees). FREYGEIST's total capital requirement is between EUR 1.2m and 1.5m. We have also worked out a back-up solution that would require EUR 500k and may be put into practice as well. What Kind of Support Do We Need? In addition to financial support, we are grateful for every like, comment, and article. The more people are aware of FREYGEIST, the more successful our market launch will be! During our campaign, we will organize test ride events in various cities. We will email you about these events in advance. Sign up on our website www.freygeist-bikes.com! You can also preorder your own FREYGEIST bike there. In the sales department, we are looking for both retailers and brand ambassadors who want to shape urban mobility together with us! Have a look at our rewards. We hope that you consider them a good deal. And if you have any suggestions, let us know! Above, we have covered the basics. However, you may still have specific questions that we have not answered yet, so you may contact us personally during our roadshow and via email, telephone, or our web form at any time. We are looking forward to your inquiries!